Market access is the fourth hurdle in the drug development process and the primary driver for global income of any new drug. Without a strategy in place for pricing, showing value for effectiveness and an understanding of the correct purchasers the drug will fail to reach its intended market. This book is based on an accredited course in this area out of The European Market Access University Diploma (EMAUD) and affiliated with The University of Claude Bernard Lyon. 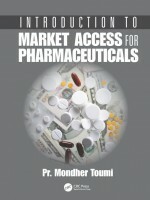 • The first guide to market access for pharmaceuticals based on tested teaching materials. • Addresses both pharmaceutical and vaccine products. • Includes case studies and scenarios. • Covers market access consdierations for Western Europe. USA, Russia, Australia, Vrazil, Canada, Japan, and Korea. • Explains the impact the changing healthcare market will have on your product.